I thought this one was kind of easy. It was The Dunwich Horror, based on H.P. Lovecraft, and adapted by future Oscar-winner Curtis Hanson. The cast includes former youth star Sandra Dee, former child-actor and future Oscar nominee Dean Stockwell, Oscar nominees Talia Shire and Sam Jaffe, and Oscar winner Ed Begley. In the film Ed Begley discusses the Necronomicon, a book that shows up in a lot of horror movies and stories. A gypsy wedding is disrupted by a creature that was buried alive in the 15th century. This movie has lots of red capes and hoods. Name the movie and the name of the villain. That was fast. Your thread, Lawrence. 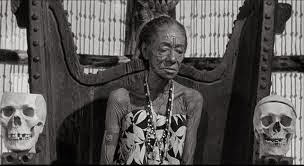 This B-movie shows up on a lot of public-domain horror movie sets. It features some familiar faces involved in a cult. The male lead dreams about the female lead before he ever meets her. The "High Executioner" of the cult also runs a doll shop. Name the movie, the two leads, and who plays the High Executioner. For bonus points you can name the "Great Devil God" that they worship. Linda Christian, Robert Alda, Neil Hamilton as the H.E. A woman becomes her own niece in this film. It's not a vampire film, but necks are involved. Name the film, the two leads, and the part of the body that is significant to the plot. Interesting guess, but no. Hint: the neck involvement is with a certain gland. The mad doctor in the film is dispatched rather early. His wife becomes the villain, extracting secretions that make women young again. 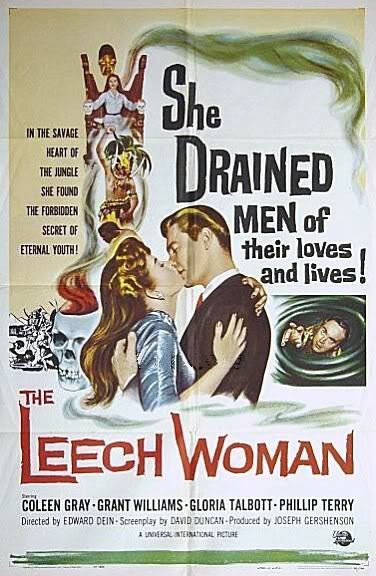 The Leech Woman (1960) Starring Coleen Gray and Grant Williams having fun with pineal glands. P.S. : For more fun with pineal glands, be sure and check out 1986's From Beyond! Next: This British-American co-production features a young woman gaining an inheritance that includes a nice house and a transmutating curse. It's not The Legacy (1978), is it? (I'm not sure I know what transmutating means). No, it's older than The Legacy by a good 2 decades or more. Transmutating = transforming (shape-changing to put it bluntly). Hint: This film bears some resemblance to a classic 40's horror film, but despite the similarities it is not a remake. "Fangs of the Living Dead" (1968)? Anita Ekberg inherits a castle and the vampire curse that goes with the castle. No, not that one, either. Still too new. This film (and it is obscure; I've never seen it) was from the 1950's. 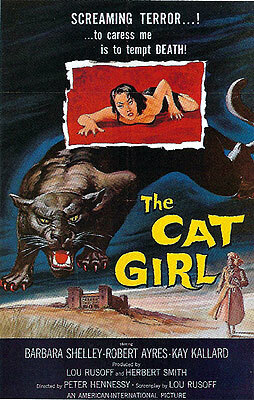 Is this The Cat Girl (1957) w/ Barbara Shelley? Your thread Liam (and nice of you to join us again)! It's been 10 days, so I don't think Liam is leaving a new question. I'll post a new one to try and get this going again, at least for the month of October. Next: This odd Pre-Code feature has a jealous man disposing of his wife's suitors via animals. The film is noted for being "astonishingly grisly", and for having a cast of notables. Name the film and 4 cast members. 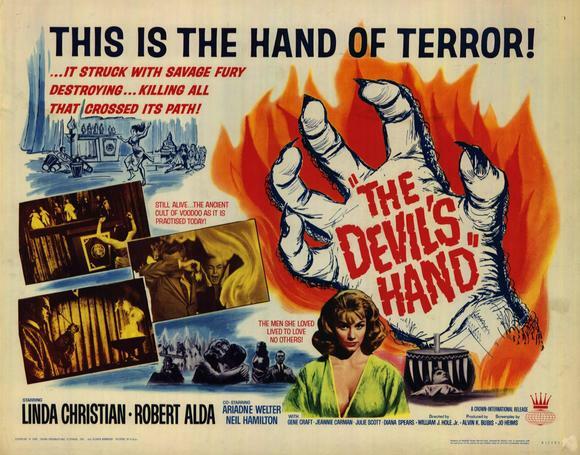 This film features three horror icons, one of whom plays a character for whom one of our TCM posters is named. Name the film, the icons, and the character/poster referenced.